For children who use walkers or wheelchairs, the elevated activity platforms on many playgrounds remain sadly out of reach. To remedy this, three Johns Hopkins undergraduate engineering students have invented a portable, air-powered device that can lift a disabled child and his or her caretaker more than 3 feet above the ground, giving them easy access to play structures. 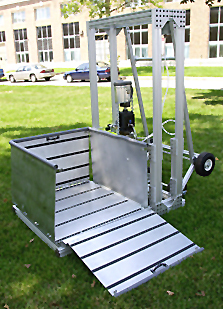 The lifting device was designed and built by seniors Christian Callaghan, Denice Koh and Nate Kruis, all 22 years old, during a two-semester course in which students tackle real-world engineering assignments, working within a budget of no more than $8,000. For the lifter project, the three students prepared a budget of $6,100, which they exceeded by only $400. They completed the device shortly before graduating in May. Callaghan, a mechanical engineering major, is from Scarsdale, N.Y. Koh, who majored in biomedical engineering, grew up in Rockville, Md. Kruis, a mechanical engineering major, is from Hershey, Pa.
Children who use leg braces, walkers or wheelchairs can easily enter the lifting device when one side is folded down to serve as a ramp. To solve this problem, the Johns Hopkins students designed an aluminum lifting device featuring a 3-foot- square passenger compartment capable of supporting 500 pounds. Their biggest challenge, however, was figuring out the safest and most efficient power source for raising and lowering the enclosure. Because the lifter was to be used outside on a busy playground, an electric motor requiring a long extension cord was ruled out. The engineering students considered water power, a weight and pulley system and other options before settling on the scuba tank. "It turned out that compressed air was the cheapest and cleanest power supply," Callaghan says. 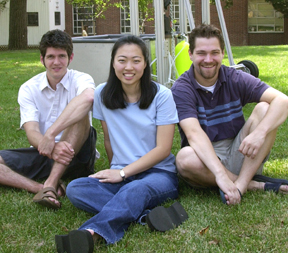 As undergraduate engineers, Nate Kruis, Denice Koh and Christian Callaghan invented a playground lifting device for children with disabilities.